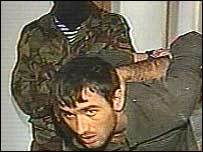 Russian TV has shown pictures of a man who is believed to have been one of the hostage-takers at the school in the southern town of Beslan. It is the very first evidence provided by the Russian authorities to back up their claim to have captured three of the hostage-takers alive. The presenter says the alleged hostage-taker was trying to escape when the special forces caught him. He had apparently shaved off his beard and was trying to flee with the liberated hostages. The report was highly triumphalist and ended with images of the corpses of the dead hostage-takers crawling with flies. The reports may go some way to reassuring ordinary Russians, many of whom are confused by the contradictory messages about casualty figures and exactly what happened in Beslan. The incident has been a massive embarrassment for the Kremlin, but the message from state television tonight is that everything is now under control. "This heavily guarded man was shown on Russian state television"